By pranavganesh. Created on Sep 15th, 2012. Last updated on Sep 29th, 2012. 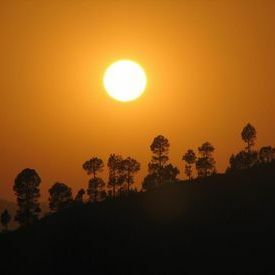 Nestled among the hills of Himalayas is the small and beautiful hill station of Lansdowne. Yes, people do know about it, though they never bother to stop by. Perhaps the charm of an ice-cream parlour, or a roller skater in Mussoorie or Nainital is far too strong for this poor little place. So, people leave it just for me. We arrived in Kotdwar in the early morning. The Kotdwar coach of the Mussoorie Express is one of two important trains that terminate in Kotdwar. The otherwise sleepy railway station comes alive when they arrive, and so does the market nearby. It’s almost a daily ritual. The trains from Delhi are the station’s bread and butter. The sloped roads of Kotdwar and the sights of an easy going life are a very apt introduction for Lansdowne. Unchecked development has become a little bit of an eye-sore, but this is common these days in any tourist place in India. Trying to find a way out of the station is a delight in itself, surrounded by men of all ages posing as coolies, but having one thing in common – an earnest innocence. A far cry from the kind of coolies you must have seen in Delhi railway station or alighting from a bus in Mussoorie, Nainital or Shimla. So we knew from this moment on, that we are in for a pleasing serendipity. We boarded a taxi, which is mostly a Sumo or a Trax, unbelievably crammed with ten people, and went up to Pauri, via of course, Lansdowne. We were approached by a few taxi-owner to rent the entire taxi, for we looked like what we were, a honeymoon couple. And don’t honeymoon couples tend to hire an entire taxi for themselves? We chose instead to travel in a pooled taxi with eight more people, for a simple reason that more than a honeymoon couple we were a struggling couple, without a piece of furniture in our tiny abode, without a refrigerator or a television. With time, this situation has changed, and the times we used to spent together conversing instead were spent in passively viewing inane soap operas, and hearing repetitive dialogues. But there was an opportunity in this predicament of a taxi ride. During the journey, we interacted with our fellow passengers who gave us good insights on what to do in Lansdowne, though our plans to spend four days in Lansdowne made them raise their eyebrows in surprise. The route to Lansdowne is a treat, and for this simple reason I advise everybody to beg, borrow or steal to get a window seat. The road meanders along a river, enticing you to disembark every now and then and have a nice walk. But then quite philosophically, we said to ourselves those famous lines “Miles to go before I sleep”. Make sure you ask your fellow passenger about the famous Siddhabali temple. The sheer setting of this temple instills a feeling of awe in you. I could try and describe it but that would hardly do its beauty any justice. And my lack of description may be incentive enough to convince you to go there. I still regret not having alighted and trekked all the way up, but one day I will. At the footsteps of Lansdowne the taxi comes to a screeching halt and an employee from the local cantonment board came knocking asking for an entry fee (a full one Indian rupee, approximately 2 cents for a slice of heaven!) to enter the cantonment area. Incidentally, this place is the headquarters of the Garwhal Rifles, which has a glorious tradition of valour and service. I learnt more about this later on, and that itself should be an attraction enough for visiting this place. There are very few places worth staying in Lansdowne and it’s a kind of chicken and egg situation. A near absence of tourist infrastructure makes you wonder if it’s worth taking all the effort to visit this place. And if tourist infrastructure were to develop comes, it would soon be follows by hordes of picnickers, who totally commercialize the location. I stayed in the PWD Resthouse, a colonial beauty. I had my contacts in the department. Do meet the officer in charge, Mr. Pati, over there, if he has not already been transferred. I was there in 2004. He has almost single-handedly created a small and beautiful botanical garden in the campus of the PWD Office. There is also a Forest Department Rest House and a Cantonment Board Rest House. Again, you need to have your networks in the offices concerned. For ordinary souls, though, the more upscale options are the GMVN Lodge, having all the creature comforts. It is a bit of a concrete jungle nevertheless. And then there is this small and beautiful cottage-like Fairydale Resort, with a kind of village belle’s charm, tranquil and soothing. It is a must to experience. I didn’t actually stay there, but sometimes you can judge a book by its cover. The staff is absolutely wonderful and the atmosphere most heartwarming. For the budget traveler there is the Mayur Guest house, which is bang opposite the taxi-stand. The place may be noisy, but it is worth it because it has quick access to the taxi-stand and, by extension therefore, any excursion. The food, which the adjoining restaurant serves, is an absolute delight, and the owner is a Lansdowne veteran and therefore an encyclopedia of things-to-do in Lansdowne. So, while my wife settled down in the guest house, I checked out the neighbourhood and arranged for some breakfast for our famished souls at the Mayur Guest house. And while they prepared Gobhi Paratha and Mooli Paratha for me, I had a casual chat with the owner of the place, and filled myself with vital information regarding must-do’s, and the how-to-do’s. A trip to Lansdowne cannot be complete without an aimless wandering in the cresty-troughy lanes of the place. And this is exactly what we did, after a sumptuous breakfast. Any walk is a sight-seeing experience in itself, for the simple reason that this is a very small place. So no matter where you go and whatever route you take, you will come across the small wayside chapel of St. Mary’s, which has been taken over by the Garwhal Regiment and converted into a small museum. You also come across the chapel of St. John’s, which even today is a functional church, and conducts mass on Sundays. Both of them are fabulous, straight out of some medieval European setting. Nearby is an old cemetery of the British Raj era, smaller than some of the ones I had seen earlier in Mussoorie, but nevertheless interesting. Do spend some time reading tombstones over there. Then there is also a Santoshi Mata temple, a less than arduous climb of more than a few steps, which is also the highest point in Lansdowne. Views from this place are spectacular. For an even more spectacular view, head towards a point called Tiffin Top. It is perhaps the most celebrated spot in Lansdowne. The views definitely are straight out of some scenic painting. It’s a panoramic vantage point, from where you can see the mighty Himalayas and the tiny mountain hamlets along its slopes. Do carry some water some food with you. This place will engage you for hours together, the way it engaged us. Refreshed by the enchanting beauty of the place, we walked further to the pride of Lansdowne – Bhulla Lake. Bhulla Lake is a man-made small lake, constructed by the Jawans of Garwhal Regiment. The Jawan of the regiment is called Bhulla, and therefore the name. The place is perhaps the most beautiful place in Lansdowne. We happened to reach there when clouds were playing hide and seek on the surface of the lake. Boating in it was an unforgettable experience. It’s not Nainital. It’s more magical. After boating for two hours, I looked at the watch. It was five. We rushed back to our guest house and had a wonderful cup of tea, which Bahadur the keeper of the guest house, had prepared. After tea, we had a stroll near the taxi stand, the Sadar bazaar, a nearby gurudwara, and a nearby mosque. Somebody told me that this is one of the few mosques where Shias and Sunnis pray together. I wondered if solutions to all the problems in the world were so simple. By now it was dark, so we returned to the guest house. A wonderful day indeed! A big reason for Lansdowne’s aesthetic appeal lies in the fact that it is a cantonment. By and large, Indian cantonments are civically more appealing than their municipal counterparts. While on our way to Lansdowne from Kotdwar, we came across many army vehicles and we came to know that Lansdowne is also the headquarters of Garwhal Regiment. Apparently we did very little research on Lansdowne before embarking upon our honeymoon, in fact a non-mention of this place in the usual tourist circuit was a reason enough to form an opinion and arrange a vacation. Not doing any research is not the perfect way of travelling, but it’s one of the most serendipitous. I have travelled extensively this way and have discovered unmentioned jewels – I wanted to go to Leh and took a wrong turn beyond the Rohtang (literally, that is) to reach Spiti! Similarly, after trekking along the Konkans for twelve days, I wanted to get out of the place and reach Pune or Mumbai, and I stumbled upon the beautiful Amboli. So reaching Lansdowne and getting to know the tradition of valour and service, which Garwhal Regiment stands for was a sheer unanticipated delight. The next morning, we woke up early and tried finding our way to the Kaleshwar Mahadev Temple. Local traditions say that the temple predates Lansdowne and because of this temple, Kaludanda, Lansdowne’s earlier avatar, came into being. Then came the British and found the climate of the place to their liking, and Lansdowne was born. It’s also said that the Shivalinga of the temple is swayambhu (self-formed) and was accidentally discovered by local cowherds, when their cows went missing and were found milking upon the Linga on a Mahashivratri. The way to the temple is through the Sadar bazaar. On an early morning, you can also catch up with the laidback activity of the bazaar, which has its own charm. And then walk your way down to Kaleshwar Mahadev. The setting of this temple is serene, but a dharamshala was being built bang opposite the temple, in a very unaesthetic manner. I am yet to see the end result. While trying to find our way out of the place, and trying to avoid going to the Sadar bazaar again, we took another path and strayed into the cantonment area. The beautiful regiments Durga Mandir is a must visit, and so is the Parade maidan. In an early morning and around dusk, one can see the jawans doing parade in the Maidan. Walking along the winding roads from the Durga mandir to the parade grounds, you can see the jawans engaged in various activities, but the most interesting of them all is to see them practising music with the help of two wooden sticks and a wooden slab. Despite my curiosity, I was unable to find out the Why’s and How’s of that interesting ritual. Near the parade grounds is the Garwhal Regiment memorial and a museum, entry to the memorial is regulated, though the guards let you in on request, especially when it’s not very crowded. The memorial has a bronze (I am not very sure about that, though the guard told me it was bronze) statue of a jawan engaged in a gun-battle. The statue is resting on a raised platform and therefore towers everything else in the vicinity, and is surrounded by a small garden. But the Garwhal Regiment museum right in front of the memorial is absolutely wonderful, you can learn about the entire history of the regiment, its exploits in the World Wars and more recent wars for our country. You can see a lot of arms and armaments of yesteryears – it’s a must for anybody who is interested in weaponry and military history, and a delight for anybody who is not. Nearby is a garden maintained by the regiment – fairly run of the mill. A small walk from the garden leads you to the Garwhal Mess, often considered to be the most well kept mess in the Indian Army. The entry to the mess is regulated but a request can get you an access to their display gallery. You can see a very good collection of armoury, weapons, trophies, and awards. Make sure you hear the story of the regimental ghost, who is still a soldier of the regiment and serving the Army. The story instills patriotism but not fear in anyone who hears it. It was a long day, but very absorbing. The more you stay in Lansdowne, the more you will be bewitched by its beauty. At one point of our vacation, I coyly whispered in my wife’s ear that we could plan our retirement out here. And to think that we were barely in our late twenties! I could have seen all the places in Lansdowne all over again, but chose not to. For, it was my last day over there and there were still a few excursions left to be embarked upon. Early next morning, we trekked to a place called Deoharikhal, this is a tiny hamlet of twenty odd houses on the Kotdwar-Lansdowne road, but it can also be reached by a trek of about 2 hours through the surrounding jungles. The route to Deoharikhal is out of some fairy tale, as you keep stumbling upon small vantage points throughout the route. The trek itself is not strenuous – allowing you to enjoy rather than sweat. You start from a place called Snow View point, from where in the winter you can see the snow capped peaks of the Himalayas. There is a rock adjacent to the point, which has space enough to accommodate two people… we named it lovers point. Two days prior, we had discovered another rock near Bhulla Lake, which has a shape of a burger… we named it Burger point. So Lansdowne is one place where you can also play Christopher Columbus for a while and discover new things and lands. From Snow View point the trek forks into two routes – one leading to Jaiharikhal and other to Deoharikhal. Jaiharikhal is a small market, which we stumbled upon later in the day while on our way to Bhairavgarhi. Actually, the word ‘khal’, it seems, is a generic term to denote a village. So, you will encounter lots of ‘khals’ while on an excursion in and around the place. On the way to Deoharikhal, you will come across Rathi Point, which is an army golf course and army warfare training ground. More beautiful than all of these attractions is the trek itself, which meanders inside the jungle and makes enchants you and scares you at the same time. Once in Deoharikhal we savoured the delight of a hot cup of tea prepared by a roadside vendor. A piece of advice, do carry a few parathas for breakfast, having breakfast while sitting on a roadside bench was fascinating beyond words. Incidentally, Deoharikhal is the same place where the toll collection station of the Cantonment Board is located, so you can get taxis to get back to Lansdowne from here very easily. After getting back to Lansdowne, we rested for a while and decided that we will cover Bhairavgarhi before departing from the place. We were tired, but we just could not say no for a place, which many say is the most beautiful excursion nearby Lansdowne. I deliberately qualify it as nearby, because three hours away from Lansdowne is this place called Tarkeshwar, which, according to everybody I consulted, is the most beautiful place in the region. However, we couldn’t go there due to the monsoons. Road conditions are bad and you have to hire an entire vehicle with a daring driver to get there and this would have cost us more than a thousand rupees. Bhairavgarhi is actually a temple on a hillock, and from the foothill it is a seven to eight kilometer trek. The landscape throughout the trek is amazingly beautiful with beautiful views of the Himalayas. Reaching the foothill of Bhairavgarhi is a bit difficult, and you have to change two vehicles to reach there. However, I would one piece of advice and that is to alight a couple of kilometers ahead of the place, to see the only degree college in the area, located amidst of a pine tree forest. You will just fall in love with the place. And after falling in love, you can walk down a couple of kilometers to reach the foothill of Bhairavgarhi. The trek to the temple is a bit arduous, so it should ideally be done in an early morning. Carry a lot of water and something to eat, as this is unlike any other temple trek with very few vendors selling tea and biscuits. All along the trek, there is only one place right at the summit that sells tea and biscuits. However, relish the entire trek because such a beautiful trek might not be possible in this area without so little toil. By the time we came back to the rest house, we were exhausted. It was the most tiring day for us but most fulfilling also. I am planning the following Ititnery with 4 yr old boy. Please suggest if it is comfortable or not. Day 1:Reach Delhi. catch overnight train to kotdwar. Day 2: reach kotdwar. Proceed to Lansdowne.s.s. Day 4: Proceed to Khirsu enroute Pauro s/s. Day 6. Proceed to Auli. Day7:Badrinath via joshimath.come back to auli. Day 8: Proceed to dhanaulti. Day 9:Mussourie s/s.catch overnight train from dehradun to delhi. Day 10: reach delhi.catch flight to kolkata. Many nice valuable information in this thread. Requesting some info from those of you who have travelled Uttrakhand in recent past. Planning a trip in March 2016 and require a big car may be a 12 seater Tempo Traveller for 5 days. Any direct contact of driver? Don't want to go to any agency first to avoid higher charge. Will start from Kotdwar, then Khirsu, Auli, Guptkashi and finally drop at Haridwar. Any information will be helpful, thanks in advance. Originally Posted by arpita.dg I am planning the following Ititnery with 4 yr old boy. Please suggest if it is comfortable or not. I want to do this in may,2016. I am little worried about uttarakhand fire...is it safe to travel on 13th may to Lansdowne khirshu and auli. Please suggest. We visited Landsdowne in 2010 and stayed at the Catholic Ashram in Jaiharikhal. Fell absolutely in love with the area and hope to go back soon. Kodtwar was another highlight! First time I've ever heard Kotdwar called a highlight. I have a plan to travel in Doon Express which don't have pantry car. Can anyone please tell me the name of a reliable food supplier in train? I have another question is the service of COMESUM is available in North Indian stations?